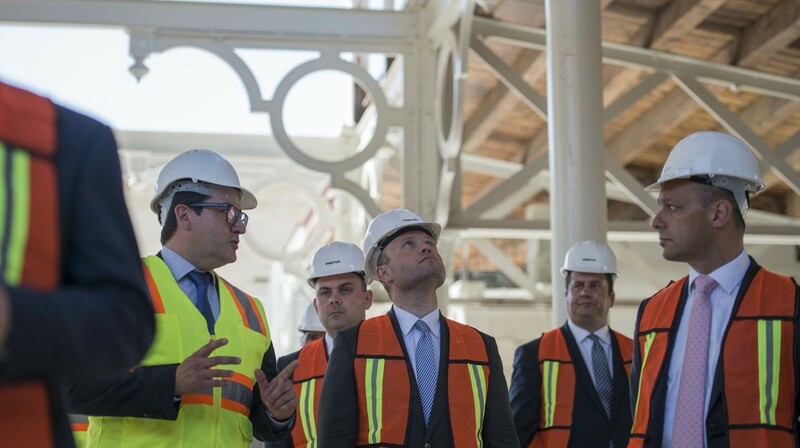 Prime Minister Joseph Muscat visited a number of Valletta 2018 flagship projects earlier this afternoon. These included MUŻA, is-Suq, the pedestrian area in Archbishop Street and The Gut in Strait Street. Addressing the media, Valletta 2018 Chairman Jason Micallef said, ” The Gut and Strait Street are examples of the economic, social and cultural regeneration taking place in Valletta where several buildings that had been closed for 50 years have been given a new lease of life thanks to the private sector and the Valletta 2018 Foundation”. It was pointed out that the first phase of The Gut in Strait Street will open in June and will employ 100 people. Is-Suq will open in the first week of October while MUŻA will be inaugurated in May 2018. Prime Minister Joseph Muscat announced that the budget for culture will be doubled next year – something which has not happened so far in history.